Anyone working in the healthcare sector can confidently predict one thing: There will never be a shortage of demand. How do you manage a growing patient population whose needs are becoming increasingly more complex? According to the Office for National Statistics (ONS), life expectancy in 2016 had nearly doubled when compared to 1841 figures. Over that time, there have been a series of transformative public health interventions such as childhood immunisations, the introduction of the NHS, scientific advances reducing premature deaths from heart disease, cancer and stroke, and positive health education which has led to a decline in smoking and improved lifestyle choices. However, healthcare demand has not reduced in line with mortality. It has boomed just like the numbers of older people who need new and evolving types of support services. Research carried out for The Guardian has found that more than two-fifths of national health spending in the UK is devoted to people over 65. Health spending per person steeply increases after the age of 50, with people aged 85 and over costing the NHS an average of £7,000 a year. By 2039, one in 12 of the population will be aged over 80 with the over 65s expected to represent 23 per cent of the population (17.5 million) according to ONS projections. Further research by the Nuffield Trust has found that the net public expenditure on social care and continuing healthcare for older people in England is projected to rise from £9.3 billion in real terms in 2010 to £12.7 billion in 2022. No wonder that in healthcare the mood is often one of frustration. And nowhere is this truer than in general practice. As individual practices struggle to meet demand, many are looking at merging. Over the past five years, 450 surgeries have closed, displacing 1.3 million patients. The system as we know it is at breaking point. But for the kind of transformation which will meet the pressures of the past and the challenges of the future, an additional £20.5bn funding per year is not enough. 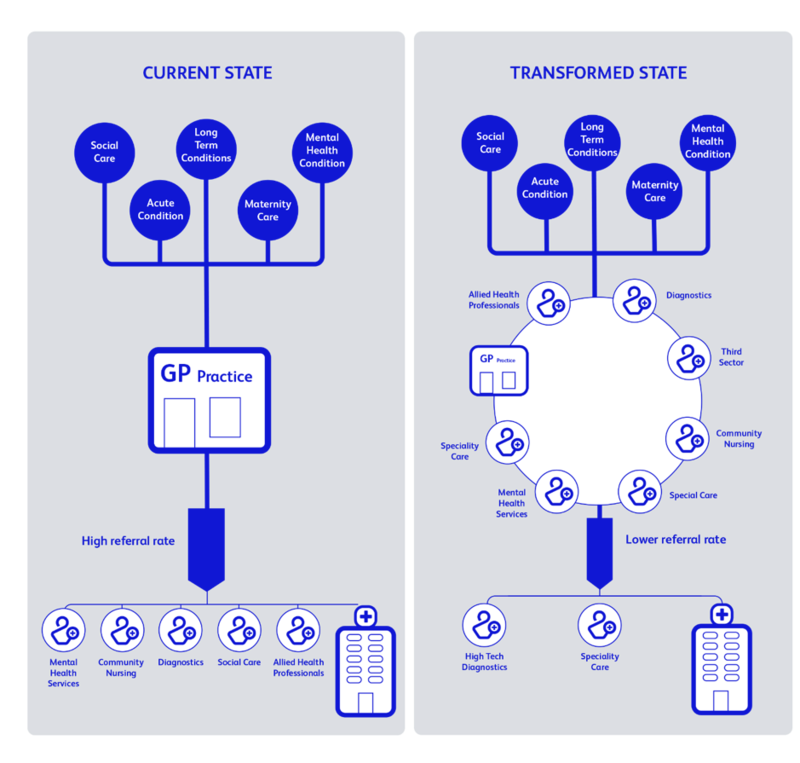 Healthcare in the UK is designed to rely on a physical gate-keeper to manage patient entry to the rest of the system – Primary care. This inevitably creates a system of bottlenecks and delays which disempowers both clinicians and patients. The Department of Health and Social Care is encouraging the development of primary care networks (PCNs) where GP practices work with community providers, mental health services, social care, pharmacy, the acute sector and voluntary services. These, alongside larger Sustainability and Transformation Partnerships (STPs) and Integrated Care Systems (ICSs), are “place-based” partnerships that offer regions more control over funding and service delivery to make better use of resources and improve the health and wellbeing of their populations. Their success rests, says the King’s Fund, “on the willingness and commitment of organisations and leaders to work collaboratively. ” The other vital component is the uptake of digital technology that improves the system, but also makes sense to both clinicians and patients. Doctorlink has created a system that tackles the bottlenecks through demand management. This doesn’t mean gate-keeping for the gate-keepers. Instead, It’s a sophisticated and holistic way to empower patients and doctors that also offers potentially significant cost savings both at local and national level. Taking inspiration from services such as banking, which have been revolutionised by technology, Doctorlink, is a way for patients to book appointments online, check their records and order repeat prescriptions while keeping in easy contact with their surgery. It offers the most clinically robust symptom checker available and can direct patients within the appropriate time frame for their possible conditions, whether that means recommending a video consultation or a trip to A&E. In this way, it helps create a framework for truly joined-up care, achieved via innovation and digital technology. 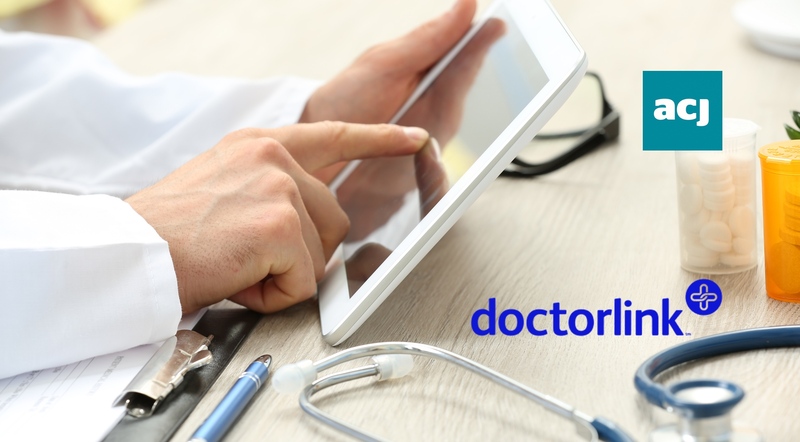 Doctorlink, which is already being implemented by a number of STPs and is accessible to millions of patients, supports doctors by reducing administration and referral times and frees up more time for clinicians to practice medicine.